The strong economic data from the US supported USD to grow such as: durable goods data and the unemployment claims data. 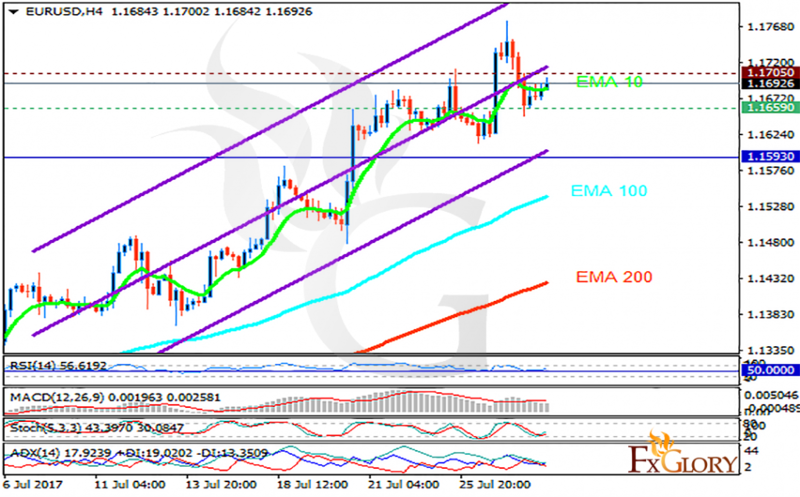 The support rests at 1.16590 with resistance at 1.17050 which both lines are above the weekly pivot point at 1.15930. The EMA of 10 is moving with bullish bias along the ascendant channel and it is above the EMA of 200 and the EMA of 100. The RSI is rising towards the overbought area, the Stochastic is showing upward momentum and the MACD indicator is in positive territory. The ADX is showing weak buy signals. The support level breakthrough will smooth the way for the correction pattern towards 1.16 otherwise, the pair will continue its bullish trend towards 1.18.